بوٙرکینافاسو یاٛ ڤولاتٱ ک ھا د ٱفتاونشیݩ ھوماپاٛڤٱن آفریقا ، پاتٱخت اؽ ڤولات شٱر آڤادوگو ٱ. ↑ "Burkina Faso population projection" (in fr). insd.bf. 2014. Archived from the original on 1 September 2014. https://web.archive.org/web/20140901021928/http://www.insd.bf/fr/. Retrieved 1 October 2014. 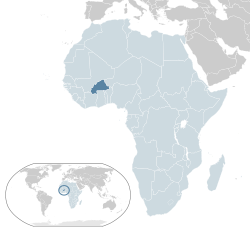 ↑ ۲٫۰ ۲٫۱ ۲٫۲ ۲٫۳ "Burkina Faso". International Monetary Fund. http://www.imf.org/external/pubs/ft/weo/2016/01/weodata/weorept.aspx?pr.x=23&pr.y=1&sy=2016&ey=2021&scsm=1&ssd=1&sort=country&ds=.&br=1&c=748&s=NGDPD%2CNGDPDPC%2CPPPGDP%2CPPPPC%2CLP&grp=0&a=. د نۊ زنٱ بیٱ د"https://lrc.wikipedia.org/w/index.php?title=بۊرکینافاسو&oldid=101766"
اؽ بٱلگٱ ایسنؽا آلشت بیٱ د ‏۱۵ دسامر ۲۰۱۸، د ‏۱۵:۳۶.